Is it time for a new pain-relieving algorithm? Millions of American thankfully maintain reduced pain through on-going medications and interventions. What happens to people with pain that resists treatment of any kind? Has First-Principles thinking broken the treatment-resistant pain barrier? Increasing computing power enables deep-learning algorithms to improve medical interventions. Since ancient times, practitioners of light-based therapies applied those First-Principles for the benefit of their patients. One person was specially recognized. Niels Finsen researched the curative properties of different colors. Dr. Finsen found that no single wavelength worked for every disorder, just like medications. Finsen lacked the tools for testing each wavelength for what it might accomplish. Figure 1 - Niels Finsen was awarded the 1903 Nobel Prize in Medicine. What can an updated algorithm achieve? PhotoMed’s team of nerdy engineers developed tools that would fascinate Dr. Finsen. He would delight in seeing the rapid responses in people with treatment-resistant pain. It would take more than a century to answer one of Finsen’s basic questions. Does it take one, two, or a sequence of wavelengths to help individual patients? PhotoMed’s tools enable the first comparisons of the effects of different wavelengths in the same person during each visit. PhotoMed’s Instant Feedback System™ provides one more tool for pain specialists to help their patients. In studies, anesthesiologists and neurologists welcomed the tool’s low risk to the patient. They were excited by the outcomes. We don’t have a clue how the body manages its return towards normal functions. Figure 2 - The Instant Feedback System™ provides relief for patients with treatment-resistant pain. Recordings in real time document the treatments, responses, and outcomes. 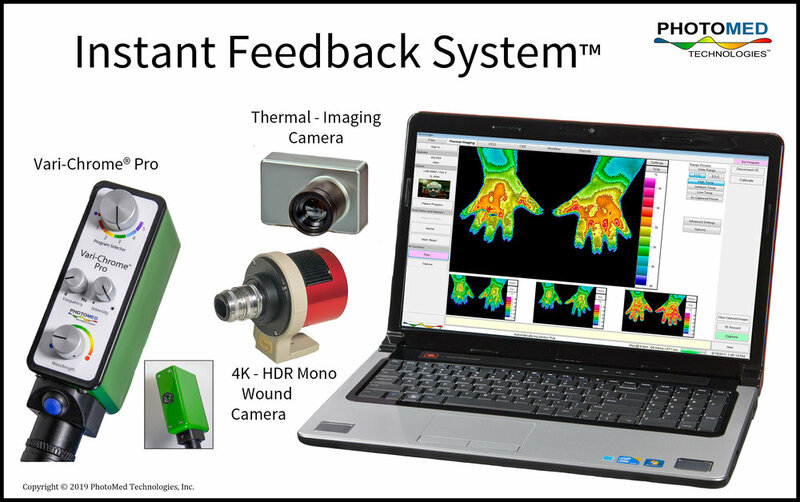 Thermal imaging provides feedback to the operator to adjust the therapy during the visit. Researchers can revisit events that would traditionally be overlooked. Who will be the next Niels Finsen? Don’t need electronic feedback? You can use the Vari-Chrome® Pro by itself. 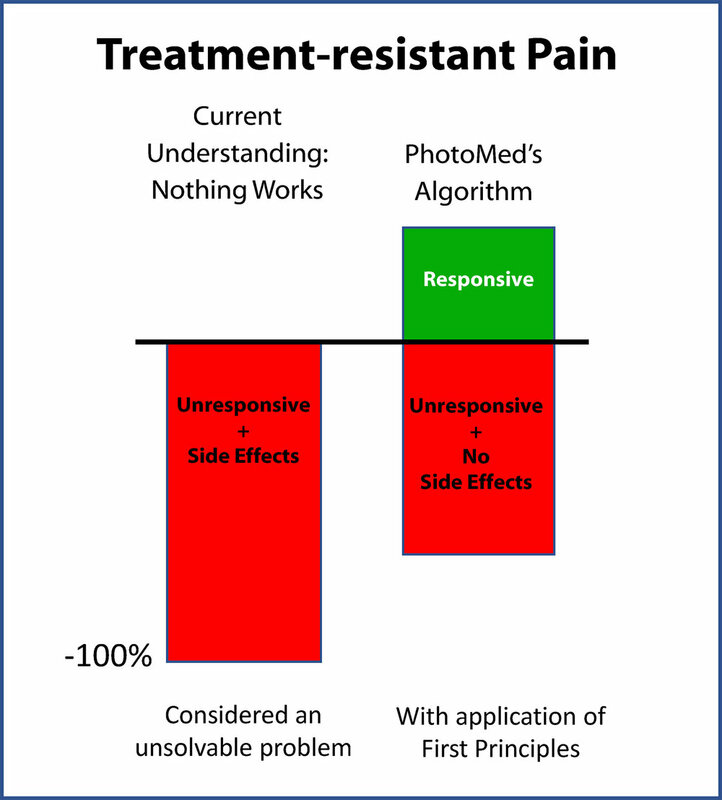 The current understanding of treatment-resistant pain is that nothing works. The pain specialist considers the escalating risk to the patient while planning the next intervention. Unfortunately, testing interventions for possible relief leaves many with side effects that are worse than the pain. Now they have two, or more, problems that won’t quit. We thank the 400+ people who volunteered to help develop PhotoMed’s algorithm. Volunteers typically arrived with multiple impaired functions. Each person participated with the hope, but not the expectation, of relieved pain. However, many were astounded by their improved functions and pain relief. See Figure 2. Figure 3 - PhotoMed's algorithm aims to help people for whom Nothing Works to relied pain or improve functions despite trying the best interventions available. Learn if it works, or not, in 2 visits for 2 cents worth of electricity. Is there is more to this story? Research in neuroscience, pain, physiology, and other fields. Exemplary cases suggest new areas for research and patient care. Improved functions persist after therapy ends. Of course, the patient or volunteer can still report their subjective pain level. However, that information typically arrives too late to make during-visit adjustment to therapy. An example, Robert (not his real name) had persistently uncomfortably cold hands for 30 years before his first test of PhotoMed’s algorithm. His hands warmed during each of three visits and remained comfortable for more than a year. Robert’s hands remained comfortable for more than a year in the absence of therapy. Credit for maintaining benefit goes to the body and not the therapy. Click here for a partial list of disorders that responded to PhotoMed’s algorithm.